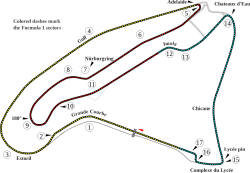 Circuit de Nevers Magny-Cours is a motor racing circuit in France, near the towns of Magny-Cours and Nevers. It is often called just Magny-Cours. It is most well known for hosting the Formula One French Grand Prix, which was held there between 1991 and 2008. The circuit was built in 1960 by Jean Bernigaud. It was the home to the L'école de pilotage Winfield racing school. The school provided such drivers as François Cevert and Jacques Laffite. In the 1980s, the track condition was not very good. It needed a lot of repairs. The circuit was not used for international racing until it was purchased by the Regional Conseil de la Nièvre. In the 1990s the Ligier (later known as Prost) Formula One team was based at the circuit. They did a lot of their testing at Magny-Cours. It started hosting the F1 French Grand Prix in 1991, and the Bol d'Or motorcycle race in 2000. The circuit was re-designed in 2003 and used for a wide range of events include various sports and commercial use. The circuit does not provide many overtaking opportunities. The races here are commonly regarded as quite uneventful. For the 2003 event, the final corner and chicane were changed in an effort to increase overtaking. It did not help much. The change did make the pitlane much shorter. Because less time was lost making a pit stop, Michael Schumacher was able to win the 2004 French Grand Prix using a four-stop strategy. In 2006, the circuit was the scene of more Formula One history. Michael Schumacher became the first driver to win a single Grand Prix 8 times at the same circuit. 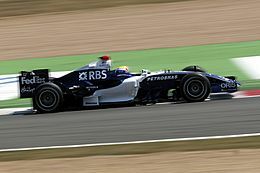 The 2007 race was to mark the last French Grand Prix at Magny-Cours. The French Grand Prix had been indefinitely suspended from the Formula One calendar. Bernie Ecclestone originally said that F1 would not return to Magny-Cours in 2008. He wanted to move to another location, possibly in Paris. When the official calendar on July 2007, the 2008 French Grand Prix was still in place at Magny-Cours. In May 2008, Ecclestone confirmed that Magny-Cours would stop hosting the French Grand Prix after the 2008 race. He suggested he was looking into hosting the French Grand Prix on the streets of Paris. In June 2008, the provisional calendar for the 2009 season was released. The French Grand Prix at Magny-Cours appeared on it, scheduled for 28 June. However, in October 2008 the 2009 French Grand Prix was canceled after the French Motorsports Federation (FFSA) withdrew financing for the event. In 2009 the track hosted its first Superleague Formula event. It has also been confirmed it will host a second event in 2010. The current track is a modern, smooth circuit. It has good facilities for the teams and spectators. It is 250 km (160 mi) from Paris in central France. Many corners are modeled on famous turns from other circuits, and are named after those circuits. Examples include the fast Estoril corner and the Adelaide hairpin. It has a mix of slow hairpins and high-speed chicane sections. It includes a long fast straight into the first-gear Adelaide hairpin, the best overtaking opportunity on the circuit. The circuit is very flat with little change in elevation. It does not provide many overtaking opportunities, despite modifications in 2003. Circuit de Nevers Magny-Cours Facts for Kids. Kiddle Encyclopedia.